Kinship is the most basic principle of organizing individuals into social groups, roles, and categories. Some form of organization based on parentage and marriage is present in every human society. In modern industrial communities family structures have been weakened by the dominance of the market economy and the provision of state organized social services. However, the nuclear family household is still the fundamental institution responsible for rearing children and organizing consumption. In nonindustrial contexts, kinship units normally have a much wider array of functions. They often serve as basic units of production, political representation and even as religious bodies for the worship of spiritual beings, who are themselves considered members of the kingroup. 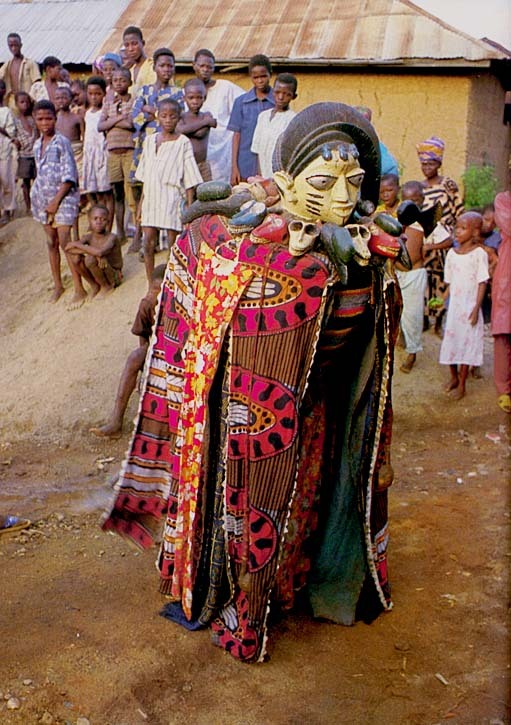 The Yoruba of West Africa commemorate family ancestors in the form of masked dancers who become possessed by the spirits of the dead to commune with their descendants. Image credit: © 1997 by Egba-Egbado Descendants Association. All rights reserved.